Cover the basics in graphic design with the Adobe Creative Suite to enhance your websites, apps and games with beautiful and functional design elements. Click here to see our students work with digital art. "Oh, yes! Be the next Picasso!" The impact of designing Graphic design is all around us and has an enormous impact on the way we feel about the products we use. learn from the best when it comes to technology design, new visual interfaces are at our fingertips, all waiting to be explored and enjoyed, helping us to improve and refine our daily experiences. at kidocode, you'll have the chance to combine typography, images, motion and other elements, to increase the effectiveness, potency and visual impact of your digital interfaces. wanna learn? what you will do? The Web Art course is designed to expose you to the fundamental skills required to make professional-looking, fun, and animated gingraphics that will help you engage more users in all the games, apps and websites you create. Take up the notch and come to KidoCode now!! dawn of the new era in the digital era, designers and programmers must be proficient in creating and working with digital art and need to familiarize themselves with the entire production processes of technological devices. using these tools, there is a great chance for you to change the ecosystem of the future with your creativity and compelling graphics. are you ready to take that leap? "Oh, yes! Now you can become a Graphicator!" 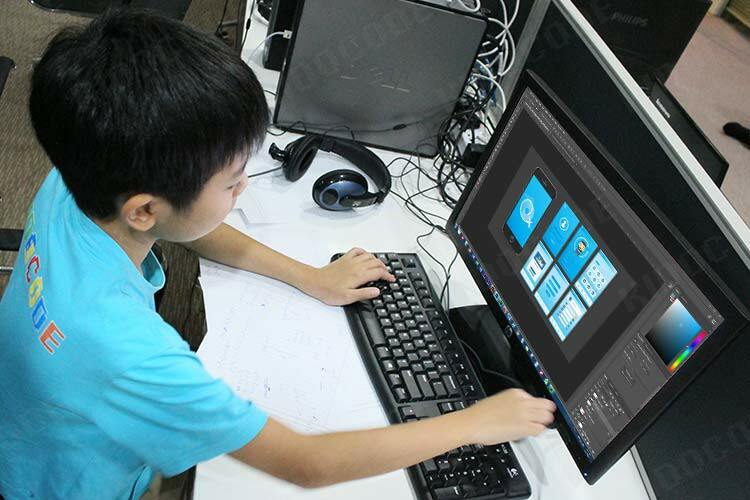 Adobe Photoshop is the standard in digital imaging and is used all over the world for graphic design, photography, image-making, video editing and more. Adobe Illustrator is graphic-driven tool used for creating vector graphics. It is mainly used for creating logos, graphics, cartoons, icons, and fonts. Unlike JPEGs, GIFs, and BMP images, vector graphics aren't made up of a grid of pixels. Instead, it comprises paths, that are defined by a series of points, curves and angles. A medium where objects are shaped to appear as moving images. Traditional it was drawn by hand on clear celluloid sheets and then shown on film. Today, animation is done using CGI.